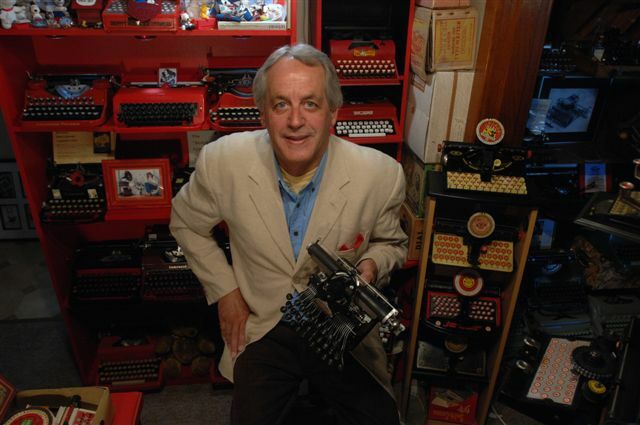 When I saw this Erika portable typewriter listed, I immediately thought it looked like a "downscale" version of the beautiful Bijou that Richard Amery so kindly gave me for my 64th birthday. What piqued my interest was that neither Richard nor I had ever previously seen this particular model listed, either as an Erika or a Bijou - other than, of course, the Bijou that Richard bought many years ago. Richard agreed with me that it looked like the same model, but with inferior paintwork. It arrived today, and so I was able to compare them. It is almost the same design, but there a few subtle differences - quite apart from the gleaming paintwork on the Bijou. The carriage knobs, the ribbon colour selector, the carriage lock - lots of little things like that. And yet they are very different typing machines. I like them both, but for different reasons. 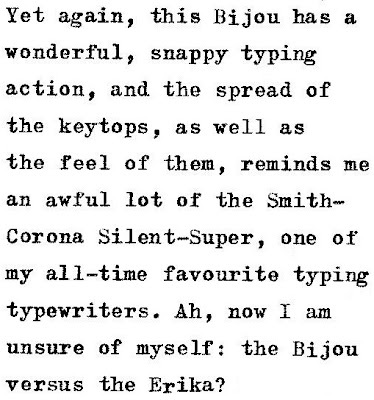 The Bijou keyboard is very much like the 1950s Smith-Coronas and Underwoods, with the keytops well spread and light to the touch. The Erika has much more of what I might call a "Germanic" feel: the keys are somehow heavier to the touch. 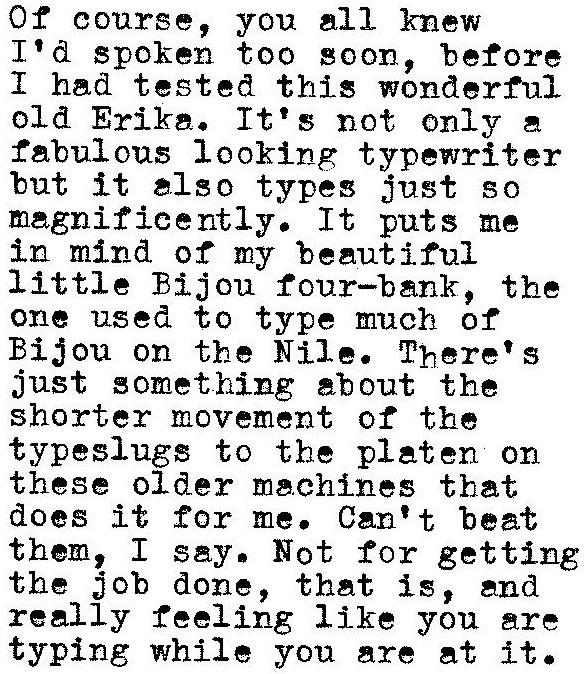 I also got out a much older Erika, one very close in design to my Bijou four-bank (though the carriages are quite different), and noticed how close the typing action on that is to American typewriters of the 1920s. 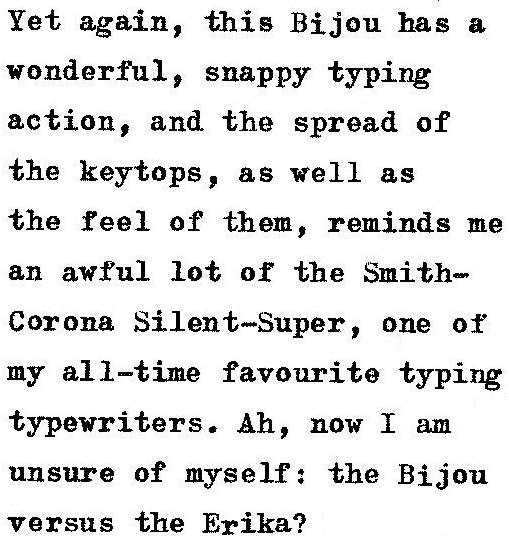 While the later Erika and his smooth sister the Bijou are very nice to type with, I actually prefer the older style machine. Those are all very nice - I'd like to try out a later model. 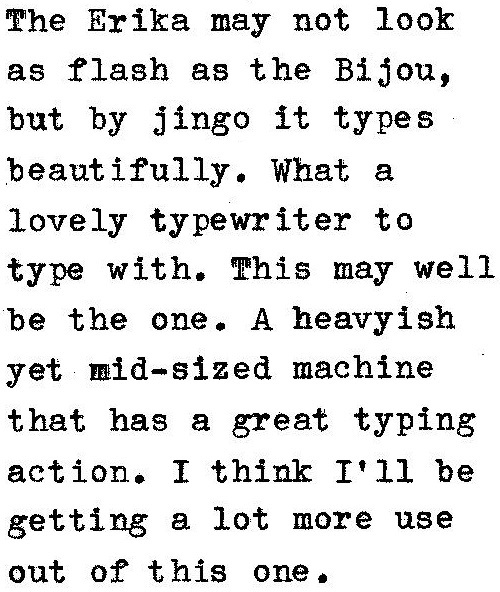 Mine's an Erika S from 1940 with a Danish keyboard. Historically interesting, and not a bad typer. Is this the one that was recently listed on AU ebay? I was hovering over the 'bid' button, with a figure which I can't recall - in the amount box. And just decided against it at the last minute, to instead concentrate on a busted-arse Noiseless (one of my 3 most wanted). Glad it went to a very appreciative home. But we were so close to you and I going toe to toe on the bidding stakes..
My Bijou is very much like that latter Erika. Solid typers with a distinctive sharp action. 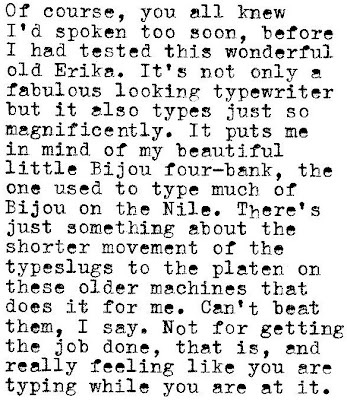 I have an Erica typewriter with an Arabic keyboard in excellent condition and its leather case. I wonder how much this is worth? @harrowwoman - I've been searching for an Arabic Script Typewriter. I would pay 100 USD for one that is in good condition plus shipping. You can email me here: lukiepete (at) yahoo.com with details. I have a Bijou front folding typewriter made between 1910 and 1927 its in great working condition. My parents mum purchased it from a second hand shop when I was a child thing it was a toy.Can anyone give me an idea of its value.